VENICE ARTS GALLERY PRESENTS "PHOTOGRAPHY IN THE DIGITAL AGE:"
This fall, Venice Arts Gallery launches its first-ever Public Programs with a series of conversations with artists, idea makers, and educators focusing on current issues and ideas in the fields of documentary photography, photojournalism, and participant media. 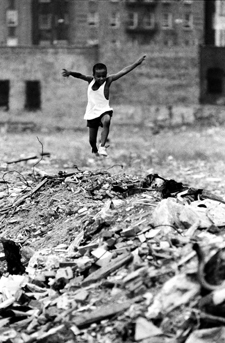 These programs augment Venice Arts Gallery’s presentation of “Injustice, Power, Unusual People,” a retrospective exhibition of work by Pulitzer Prize-nominated Photographer Jim Hubbard. On view through November 30th, the show tracks Jim’s development as a young Photographer at the “Detroit News” covering the 1967 Detroit Riots, through his most current work from Southern Africa and Palestine. The Public Programs are a joint presentation of Venice Arts and USC Institute for Photographic Empowerment. All events are free and open to the public. Wednesday, October 20 at 7pm The first program, “Documentary Photography, Photojournalism Visual Storytelling in the Digital Age,” will be a conversation with Brett Abbott, Associate Curator, Department of Photographs, The J. Paul Getty Museum; Jim Hubbard, Documentary Photographer Photojournalist; and Michael Shaw, Publisher of “BagNews.” Abbott curated The Getty Center’s current exhibition “Engaged Observers: Documentary Photography since the Sixties.” Hubbard’s work is the subject of a 40-year retrospective exhibition currently on view at Venice Arts Gallery. Shaw’s blog “BagNews” seeks to better understand the levels of meaning, underlying story lines, and various agendas reflected in prominent news photographs. The three will bring various perspectives to bear on a conversation about the changing place of documentary photography and visual storytelling in our increasingly visual culture. Wednesday, October 27 at 7pm Artist Natalie Bookchin will discuss her ongoing work entitled “Testament,” in which she uses material from culled from online video diaries (vlogs). These moving and insightful video installations focus on collectively told vignettes, stories, proclamations, and meditations reflecting on topics such as identity, the economy, illness, and politics. Bookchin’s work has been exhibited widely, including at LACMA, PS1, Mass MOCA, the Generali Foundation, the Walker Art Center, the Pompidou Centre, MOCA Los Angeles, the Whitney Museum, the Tate, and Creative Time. She has won numerous awards for her work and is co-Director of the Photography Media Program in the Art School at CalArts. Wednesday, November 10, 7pm Neal Baer, M.D., Showrunner Executive Producer of Law Order: SVU will discuss “Mash-Ups: Merging Photography with New Media for Social Change.” Drawing on the work of Venice Arts and other organizations, photographers, and writers, Dr. Baer will give a visual exploration of how photography and new media are acting as compelling advocacy tools for community storytelling and social change.